Amy Gervich is a life-long St. Louis resident. She received her undergraduate and law degrees from St. Louis University. While attending law school, she worked at Oracle Corporation and SBC as a full-time technology consultant. After graduating from law school, she began her legal career at a large defense firm in Edwardsville, Illinois, where she practiced tort and products liability law. 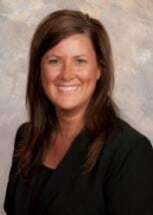 She is licensed to practice law in all state courts in Missouri and Illinois. Amy Gervich practices primarily in the area of Domestic Relations but also expands her practice to include Criminal/Traffic, Personal Injury, Real Estate and Estate Planning.